PRICE, UtahWhat time is it? a coal miner yelled out in Spanish. Its union time! 50 of his co-workers and relatives shouted back. The miners were participating in a September 25 march and rally in Salt Lake City that was part of the Immigrant Workers Freedom Ride, a cross-country immigrant rights caravan backed by the union movement. They were representing the 75 coal miners, mostly Mexican-born, who are fighting a lockout by C. W. Mining Corp, which owns the Co-op mine in Huntington, Utah. Along with hundreds of other demonstrators who had come from Oregon, Montana, Washington State, and California, the coal miners marched from the state capitol building to the federal building for a rally, and later attended a dinner and celebration at the Mexican Civic Center. The main demand of the actions is that the government facilitate legalizing the status of all immigrants in the United States. Jesús Salazar, a leader of the miners, addressed the rally from the speakers platform and explained their fight. We demand all miners must be reinstated with back pay. No more abuse and mistreatment of workers. We fight for dignity and respect. We demand fair wages. Average wages in the mining industry range from $15 to $20 an hour; at the Co-op mine most miners make between $5.15 and $7 an hour, said Salazar. The crowd let out a big boo when they heard this. Throughout the events, miners distributed a fact sheet in both English and Spanish to marchers and bystanders. Miners granted numerous interviews to the local and national press about their fight. National Public Radio, the Spanish-language networks Univisión and Telemundo, the Salt Lake Tribune, Nuestro Mundo Semanario, and La Prensa interviewed the miners present. Only three days earlier, on September 22, all 75 miners had walked out of the underground mine, protesting unsafe working conditions and in defense of a co-worker who had been suspended for union activity. The company refused to negotiate with a delegation of workers, fired everybody, and called in the Emery county sheriffs deputies to kick them off the property. The miners regrouped at a local park in town, and vowed to stay united and work with the United Mine Workers of America (UMWA). On September 24, two international representatives of the UMWA, Mike Dalpiaz and Jim Stevenson, addressed a meeting of the miners. For one month youve been organizing yourselves. Now I want to announce the full support of the UMWA. Well be with you until we win, said Dalpiaz. The miners welcomed those words with a round of loud applause. Dalpiaz also announced that the day before the UMWA had filed three unfair labor practice charges with the National Labor Relations Board (NLRB) against C. W. Mining on behalf of the fired miners. Stevenson asked miners to sign a petition to request that the NLRB organize a union representation election. All miners presentthe big majority of the workforcesigned the petition on the spot. The next day the UMWA representatives paid for the cost of the gas to get the miners and their families to the Freedom Ride event in Salt Lake City, which is two and a half hours away. The miners have been meeting almost daily since they were fired in order to reach out, gain support, and raise funds among other miners, unionists, local communities, and organizations. We raised $250 at a yard sale organized by the wives who are members of the womens auxiliary group, said Ana Sánchez, one of three women workers at the mine. Eighteen wives have been involved so far, and were planning more activities, Sanchez added. One donation of $50 was made by a retired miner who supports what were doing! she exclaimed. The same weekend the yard sale took place, four miners from the nearby Deer Creek mine, which is organized by the UMWA, came to meet with the locked-out Mexican miners. One of them asked, How can we help? Lou Shelley, the president of the UMWA local at Deer Creek, told the miners they had the backing of more than 250 union miners from his local. After that meeting the miners along with their wives and children got out to the streets and leafleted door to door through the town of Huntington, a town of about 3,000 people, where most of them live. The next day they planned to leaflet the city of Price, 20 miles away, at the local Wal-Mart store and other shopping centers. The leadership of the miners organized the children of miners, who are bilingual, to translate. 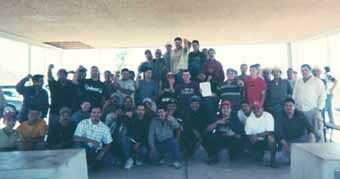 Daniel Hernández, also a miner, reported from a fund-raising picnic that one of the trailer park owners where he lives decided to contribute by not charging rent for three or four months or however long the miners remained unemployed. On September 26, when miners organized themselves in groups to pick up their paychecks, the Co-op mine bosses had the local sheriff show up again. In one instance a sheriffs deputy, ready with a translator in his car, arrested one of the miners for an unpaid traffic ticket and then questioned him about the meeting of miners he had just attended. The cop also told me all Mexicans were leaving town and asked when was I leaving, reported another miner. Picado contacted the Sheriffs Department and, with a delegation of miners, picked him up that same night from prison. For more information on how to help, or to send a contribution for this fight, write to: Co-Op Miners, UMWA Region 4, 6525 W. 44th Ave. Wheat Ridge, CO 80033. Tel: (303) 425-7110. Bill Estrada is a locked-out coal miner at the Co-op mine. LAS VEGAS, NevadaA delegation of six coal miners and a representative of the womens auxiliary who are part of the fight to organize a union at the Co-op mine in Huntington, Utah, were honored guests September 30 at the United Mine Workers of America (UMWA) special convention held in this city. The entire delegation was welcomed by a standing ovation from the more than 400 union delegates present as they were called to the stage by UMWA international president Cecil Roberts. Were fighting back and looking for support because we want to win, Jesús Salazar, a leader of the locked-out Utah miners, told the convention delegates. Speaking in Spanish, with translation provided by a coworker, he described the poor safety conditions, low wages, lack of respect from the bosses, and other conditions that led the miners to fight for a union. Salazar explained that all the miners were fired when they stood up to a company suspension of one of the workers. Roberts pledged the support of the UMWA to the locked-out miners. After Salazars remarks, delegates representing UMWA locals across the country began pledging contributions to the miners. A collection brought in $3,000 and more than $2,000 was pledged. The workers from the Co-op mine met many of the miners who made or pledged donations to their fight. For example, they were introduced to delegates from the UMWA local in Kayenta, Arizona, who are Navajo, who donated $80 in gas money to the locked-out miners for their five-hour trip to the union convention. They met long-time union fighters who told them about their experiences in other union battles, such as the 1989-91 strike against Pittston Coal. Among others they met a retired miner from Kentucky who is fighting to get the UMWA organized at a mine owned by RAG Coal Co.